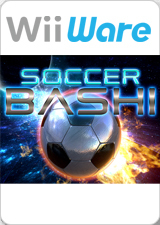 Soccer Bashi—Soccer of the Future! Experience soccer of the future—destroy the defender blocks and smash the ball into the goal to win, but watch for the enemy defenders out to destroy you! A built-in game editor offers unlimited level design possibilities, or play through the 90 game levels over several different play modes, including Arcade and Customizable Tournaments. The graph below charts the compatibility with Soccer Bashi since Dolphin's 2.0 release, listing revisions only where a compatibility change occurred. This page was last edited on 21 January 2018, at 03:15.